Don't you wish you had a grandma like this? 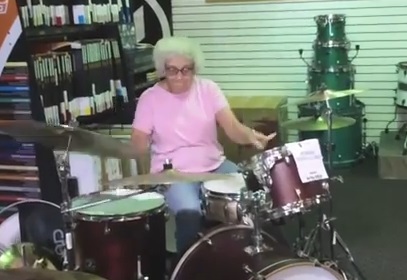 A video dubbed the ‘Grandma Drummer’ has received 1.5 million hits on YouTube. Except she’s not actually a grandma. 63-year-old Mary Hvizda regularly visits the Coalition Drum Shop in La Crosse, Wisconsin in the US. Store manager Dustin Hackworth said her specialty is performing as Garth from the movie Wayne’s World. The ‘Grandma Drummer’ used to be a member of The Shontells, La Crosse’s first all-girl rock group. You just have to see it for yourself. Take it away Mary!